February 23, 2015, 8:42 a.m. 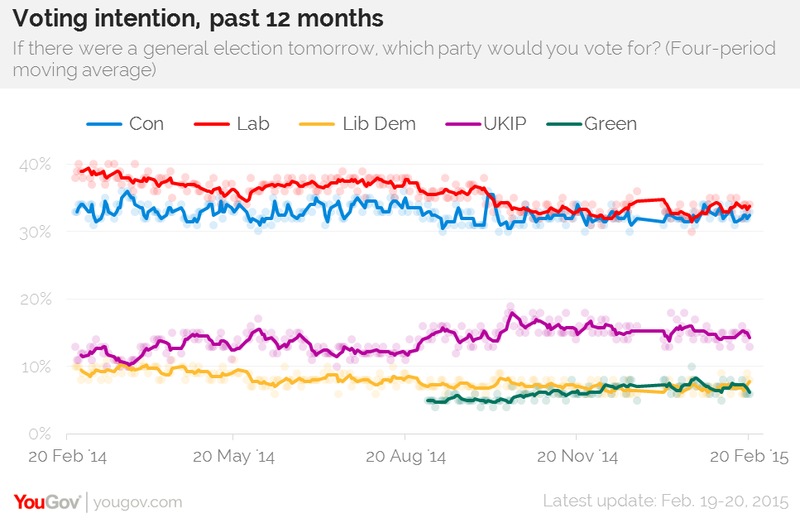 This ought to be boom time for the Tories and not just Britain. The economy growing, inflation falling, record job numbers – no government could ask for more with an election just ten weeks away. Yet support for the Conservatives is becalmed. At 33% in YouGov’s latest Sunday Times poll they are where they have been for the past 12 months. Good economic news has simply failed to translate into extra votes. Here are three reasons why. The first is paradoxically the result of a Tory success. David Cameron and George Osborne managed to pin much of the blame for the recent recession, and the decline in living standards, on the last Labour government. This is why, when the economy was still in the doldrums in 2011 and 2012, Conservative support did not fall as far as many recent governments have done in mid-term. But this meant the party has had fewer disenchanted voters to win back. Nevertheless, Tory support is still four points down on what Cameron achieved in 2010, and below what the party needs to be sure of remaining in government. Our latest poll points to the second reason why Conservative support has stalled. 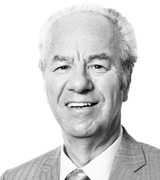 Too few people feel that they are seeing the benefit of a reviving economy. 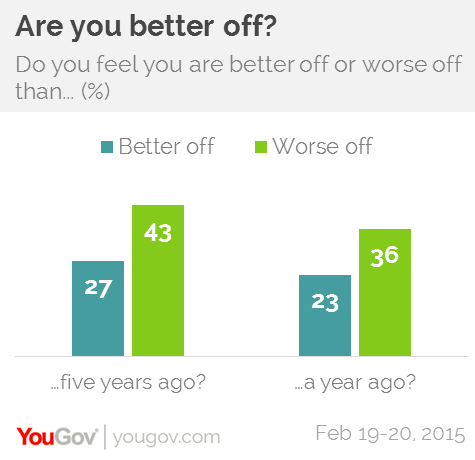 More people feel they are worse off than better off – whether they compare today’s living standards with five years ago (43% say worse, 27% better) or even one year ago (by 36-23%). To be sure, these figures are better than when we asked the same questions last spring; but the public mood is one of gradually declining pessimism, not rampant optimism. The third reason amplifies the Tories’ standard-of-living problem. The party is still widely regarded as a party of the rich. Each piece of good economic news is as likely to provoke resentment – “Cameron and his mates may be doing well, but we’re not” – as gratitude. Not that Ed Miliband and Ed Balls been able to capitalise on this sentiment. 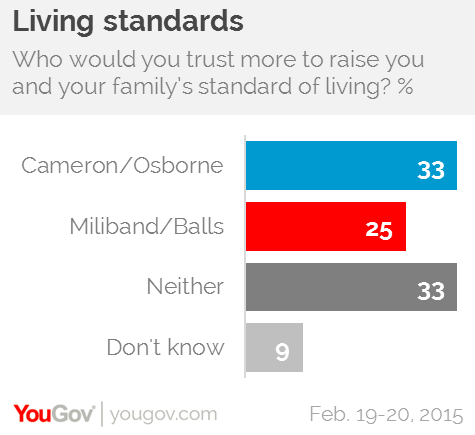 Asked to choose who they trust more to raise living standards, just 25% prefer the two Eds, while 33% prefer the Tory duo of Cameron and Osborne. This eight-point Tory lead exceeds their five-point lead when we asked the equivalent question in the run-up to the 2010 election. As significantly, fully 42% say either “neither” or “don’t know” – which helps to explain why so many voters are thinking of voting Ukip, Green or SNP. What can break the deadlock between the two main parties? The challenge for the Tories is to convert encouraging statistics into a sense of rising prosperity among millions more voters – and to persuade them that a Conservative victory would be good for the many, not the few. Labour’s challenge is different. If everyone who believed in the party’s good intentions backed it, victory would be assured. Its task is to persuade more voters that its head is as impressive as its heart: that it actually knows how to achieve its social objectives while helping businesses and families to prosper.